So, your mast truss is suspect. 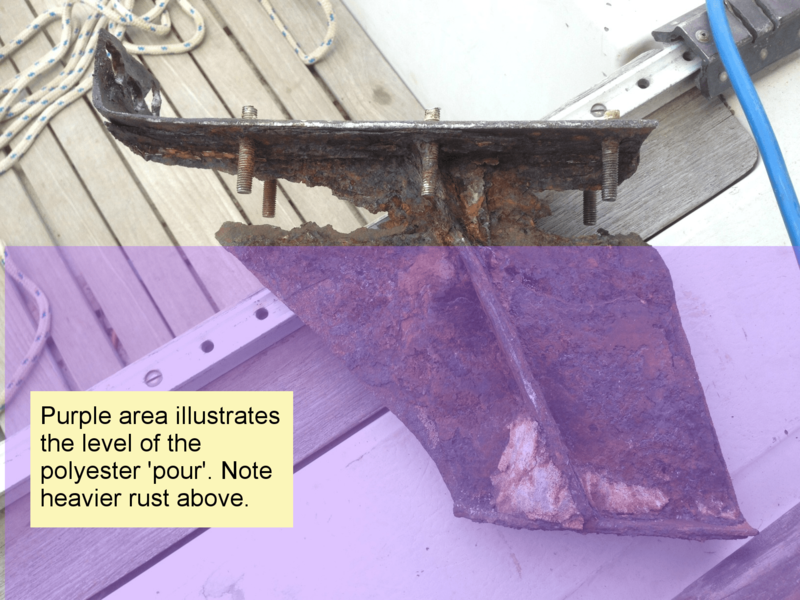 Perhaps you have a dark patch on the front of your keel, perhaps there is already a split there as detailed in our section about the mast truss. I spent long hours staring at the area of sole that would need to come out and putting off the dark day of extraction. After reading one too many horror stories and inspecting my own truss with an endoscope, I decided it had to come out. This may be one of the most grim and unpleasant jobs you will come to do on your boat, it is however, pretty simple hard graft. I would not bother trying to unscrew the six stainless steel bolts that hold the foot down. I tried heat and cold, penetrant and an impact screw driver, none of which had any effect and just wasted a morning of effort. Get yourself some good cobalt drill bits , a means to sharpen them (I personally love the Multi-Sharp) and some cutting oil, and go to town. Low speed, and as much force as you can manage without breaking the bit is the order of the day. 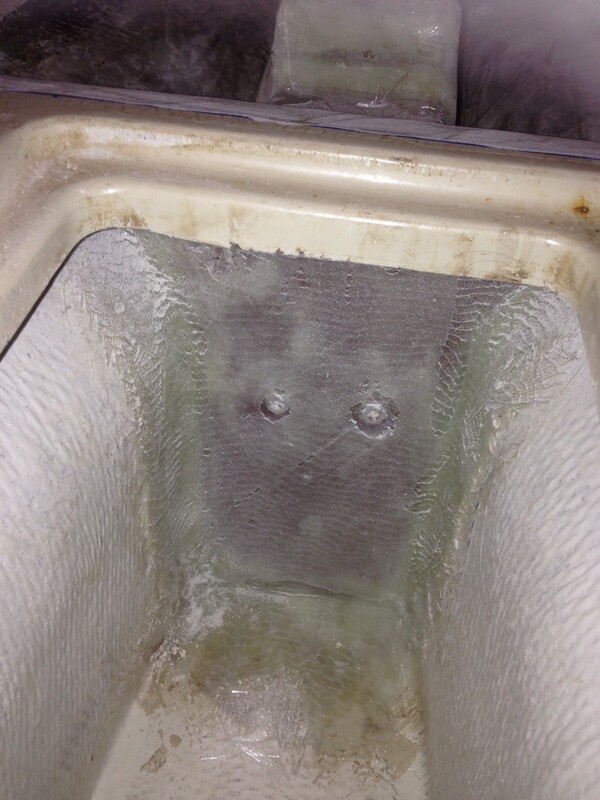 Try and keep heat build up down, as excessive heat will dull your bit in no time at all. 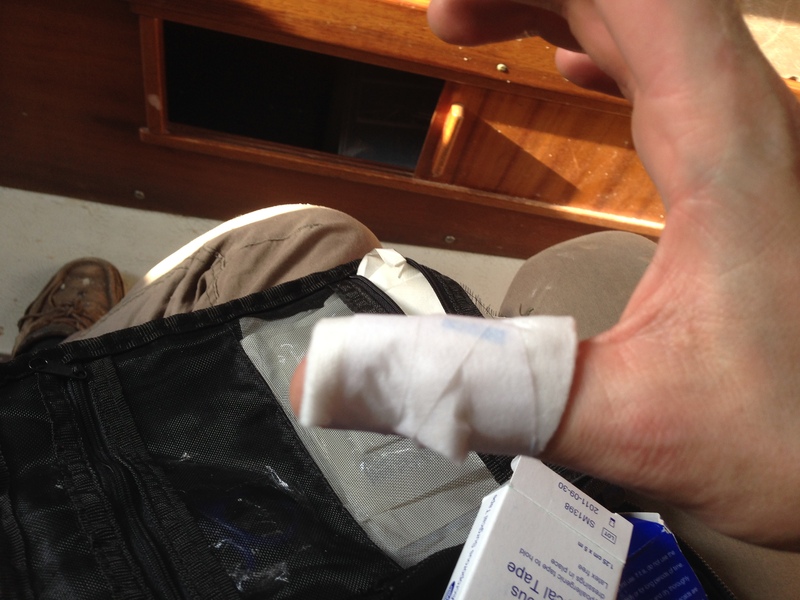 As you can see in the previous pictures I had marked up and already cut a line in the sole around the mast foot. Mark up the bulkhead just aft of the truss also, this needs to come out too. Note the black marker pen marks. The less you cut out now, and the tidier you are at this stage, will make putting the sole back together all the more easier once the job is complete. 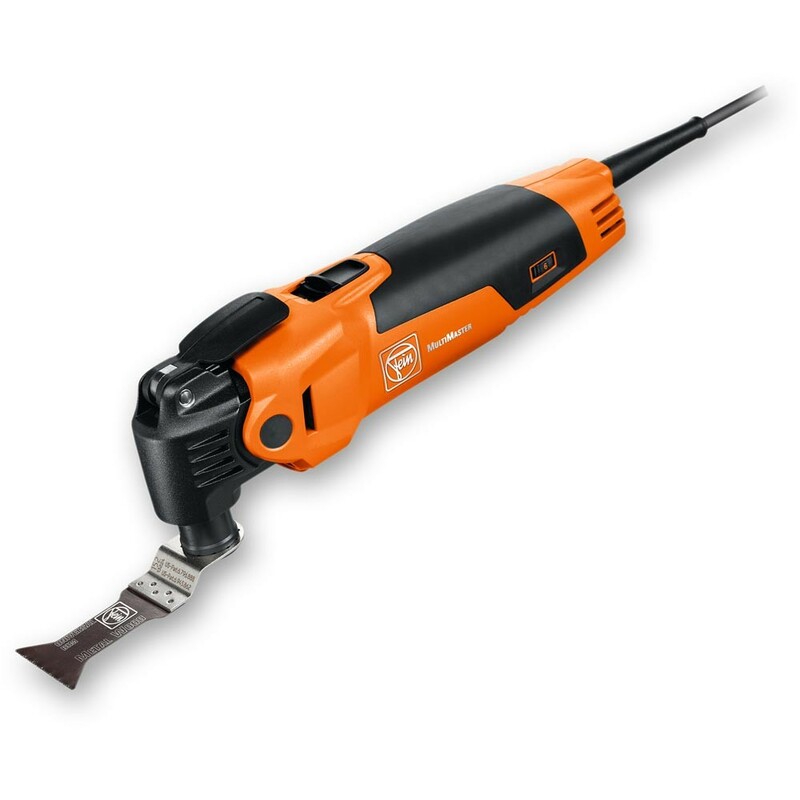 The best tool for controlled cutting safely in this way is a Multi tool (I use a Fein Multitool, which is a cracking piece of kit worth every penny). 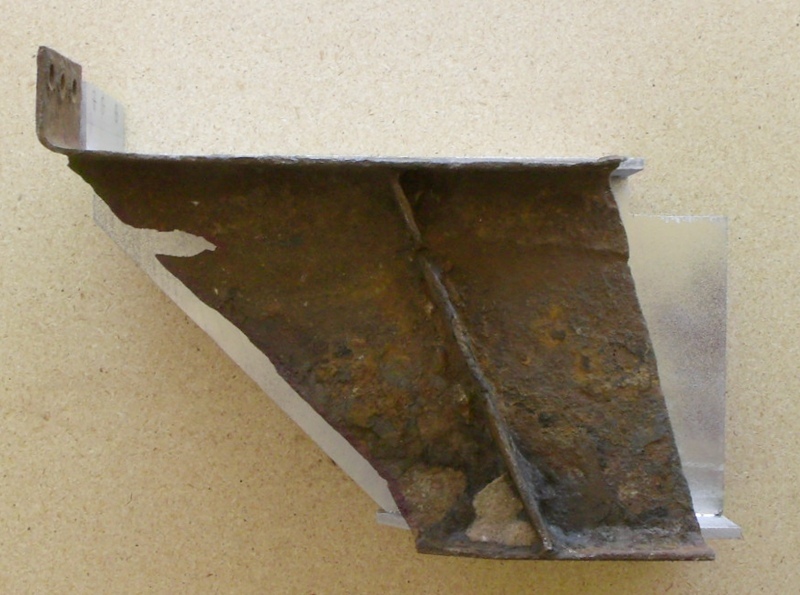 I did attempt to remove the sole, including the raised piece, in one go, however, as it is glued to the metal truss, it requires quite a lot of leverage, leading to the need to create a second cut around the base of the raised section in order to remove the sole, and then seperately prise off the truss cap shim. 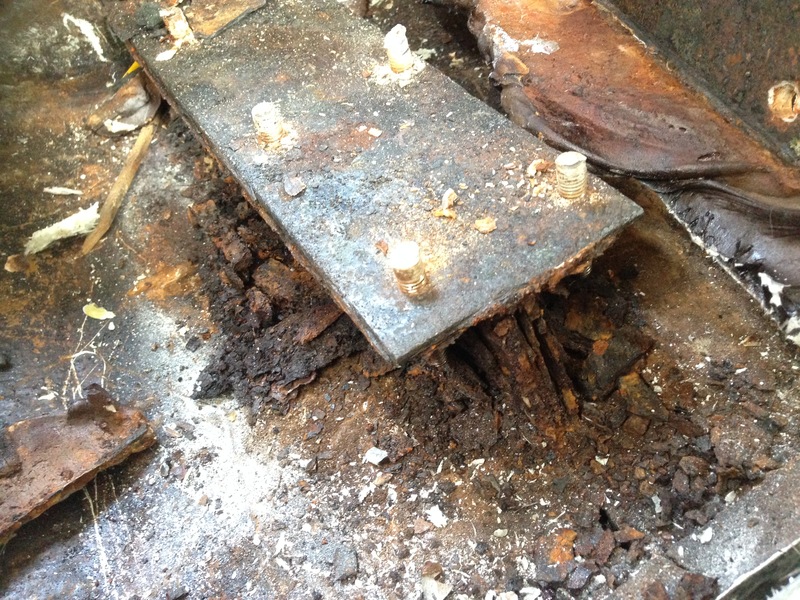 Finally, I removed the thin GRP bulkhead aft of truss and revealed the horror of what lay beneath. 1.3 Remove the truss from the resin pour. PPE! Wear goggles, thick gloves, suit up in a boiler suit and tape up your cuffs, wear ear protection, and most importantly, wear a respirator. This is nasty stuff. The dust and chippings will get everywhere. Remove all soft furnishings and items you cherish! 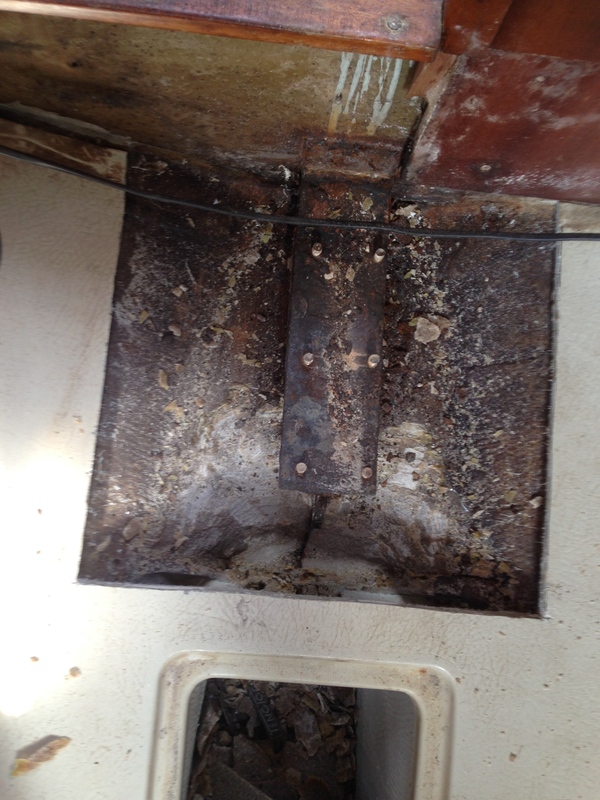 The fibreglass/polyester hull is significantly softer than the resin fill – so be careful you don’t chip through it and start making fresh, exciting new holes in your beautiful boat. 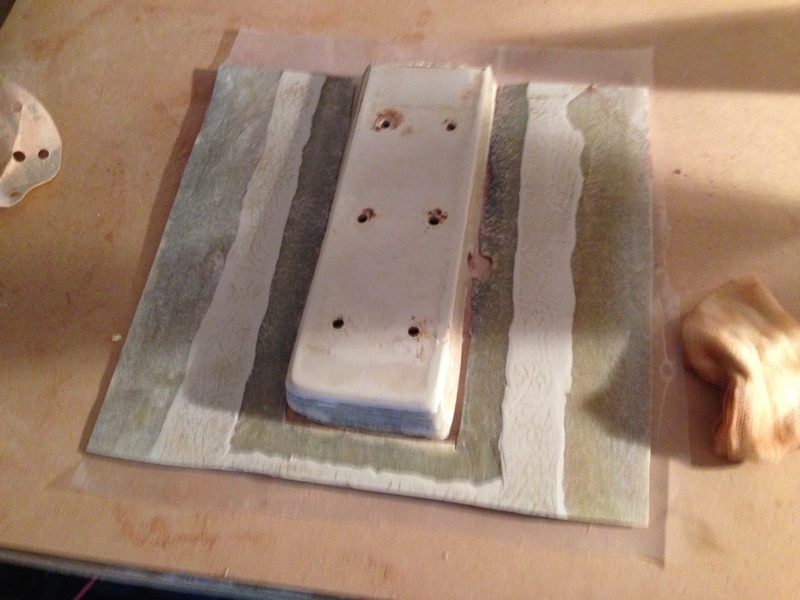 You are going to have to use force to remove the resin, there is no other way (and I asked a number of learned sources including Wessex Resins and East Coast Fibreglass). The less force you can use, the better. Polyester resin is very brittle, and remember whilst you are pounding on the resin pour, your hull is made of this stuff. Only use the required amount of force, and avoid sledges if you can. The truss sits on top of a first ‘pour’ of resin, once you have chipped down far enough (and drilled out/extracted the bolts forward of the truss), the truss will just lift out. 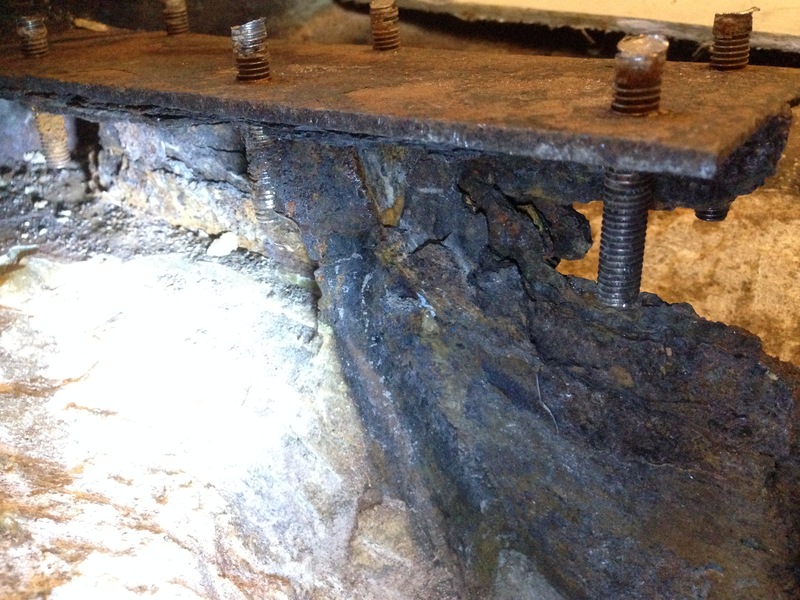 There is no need to remove the first pour of resin that sits below the truss. So, we now need to remove the block of resin marked in purple below. A small, sharp wood chisel. An angle grinder with a course sanding disc (for sharpening said chisel and tidying up the truss cavity once you are done). I also employed (but cannot suggest, as they were not a success) a cold chisel and a 2.5 kg sledge. 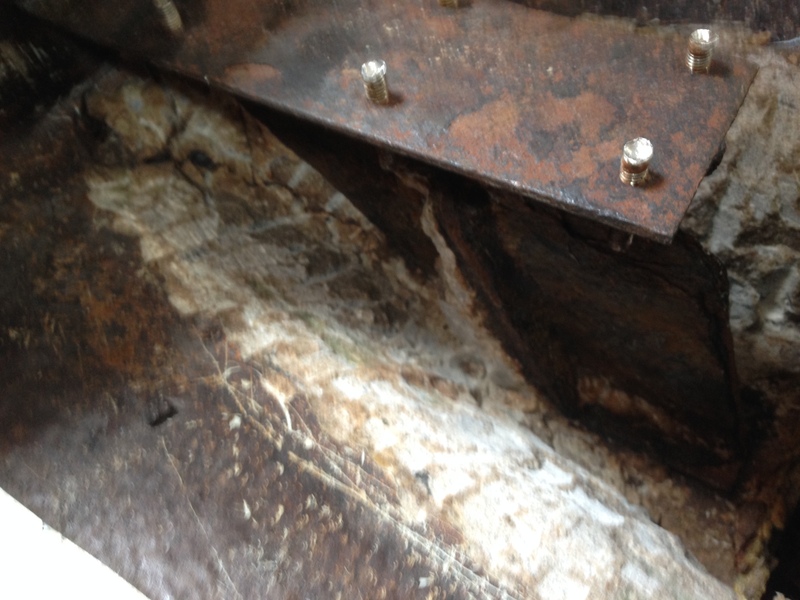 The reason we removed the aft bulkhead at this stage becomes apparent as it gives a void to ‘chip’ into. Start with the small chisel, and start at the back of the truss. Sharpen it often, and go slowly using as little force as you can. 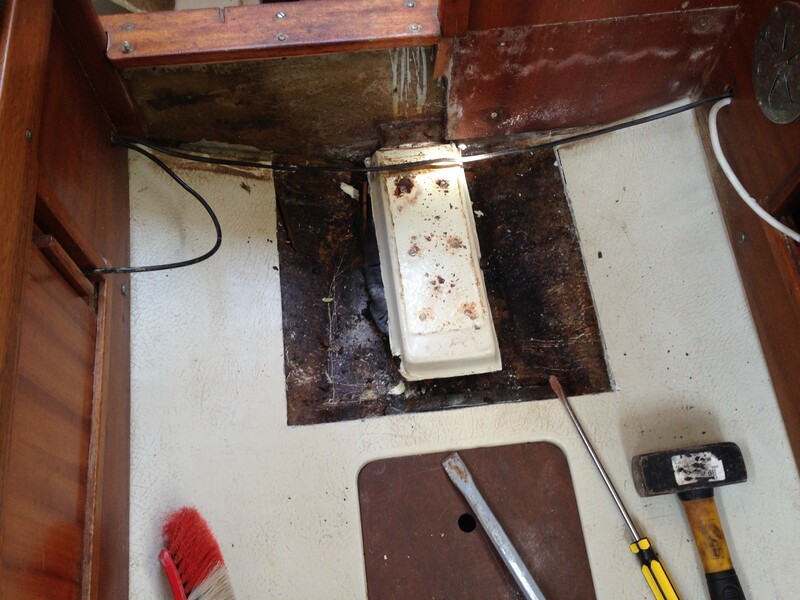 I had Triola in the water whilst I was attempting the extraction and the force of the extraction process split the front of my keel, and water started to seep in. Needless to say, I got lifted out sharpish to continue the process of extraction. Unbelievably, the least aggressive means of removing the resin pour was the SDS drill in hammer mode with the sharp chisel on it. 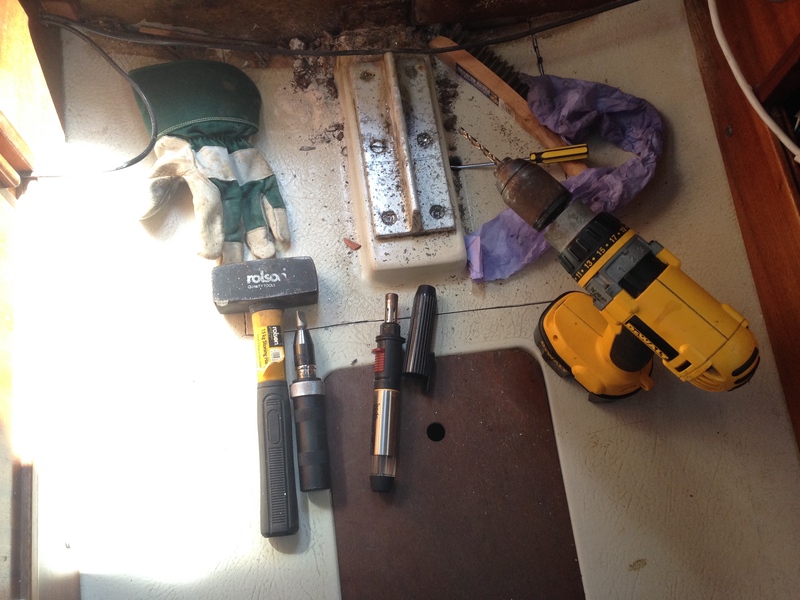 You need to be exceedingly careful when you get close to the GRP of the hull, as it will cut through it like a hot knife through butter, so I tended to resort to the small wood chisel and hammer at those points. 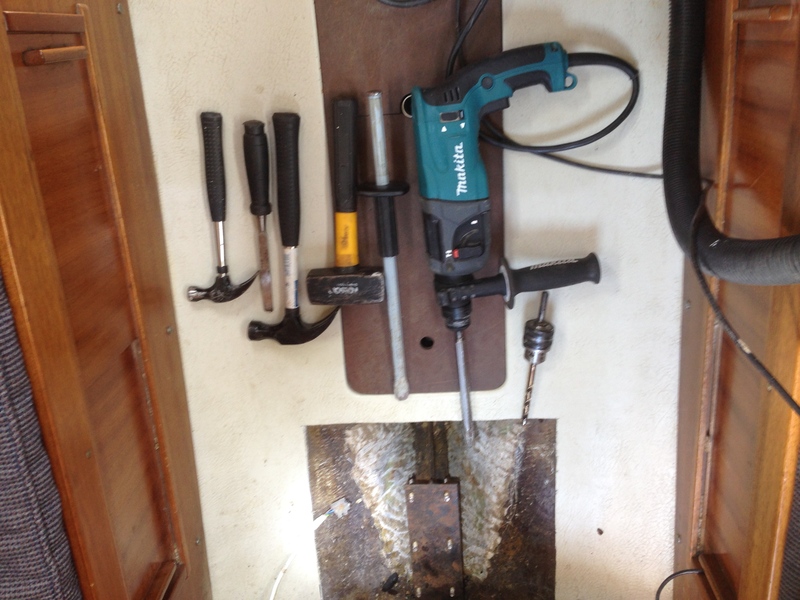 Use your cobalt drill bits again (be sure to sharpen them, there is nothing more frustrating trying to drill stainless with blunt bits) to drill out the bolts through the bulkhead just forward of the truss so it will be ready to release. 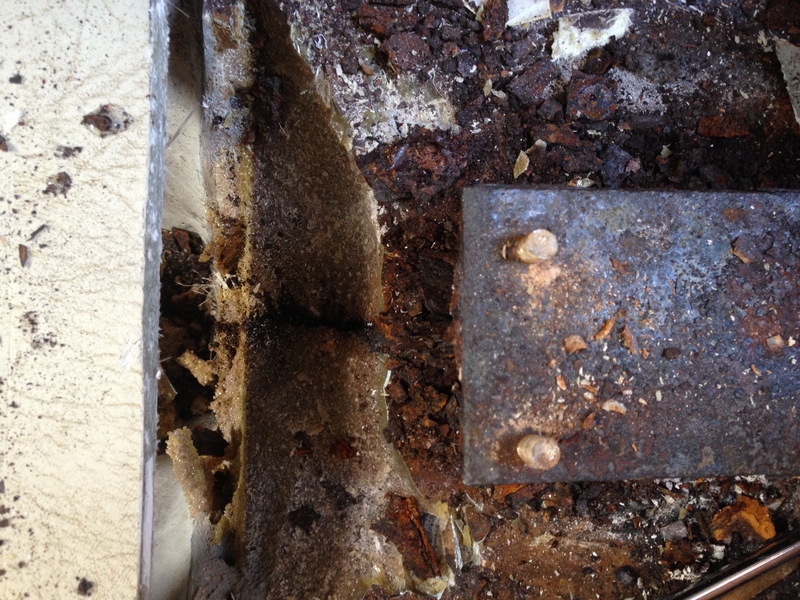 Don’t be tempted to pull on the truss as when enough of the resin is removed, it will just come free with no effort required. After much, much more tapping, bashing and otherwise cajoling, the truss will come free and you will be left with a very knarly looking truss, and a very knarly hole from whence it came. Note the big crack in front of the resin! 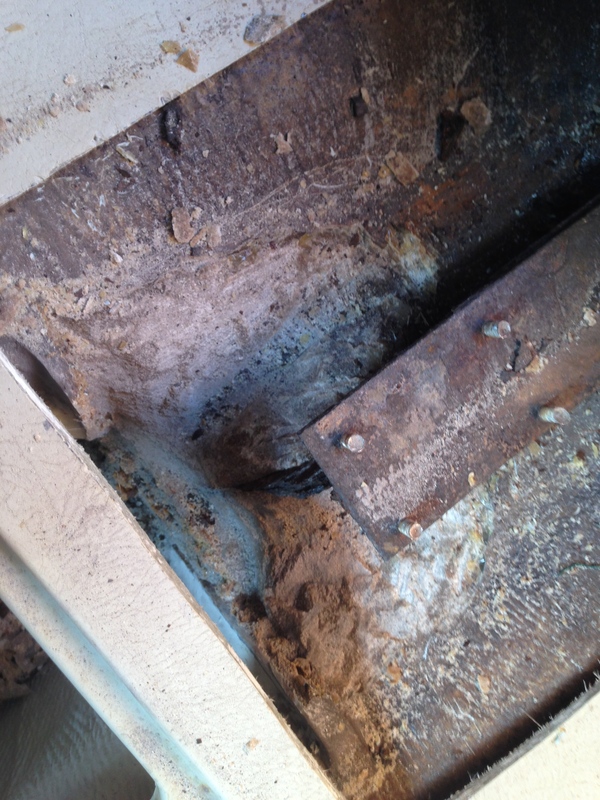 The final job you will have to do here is to remove the remaining resin to create a nice clean hole to install your new mast truss into. 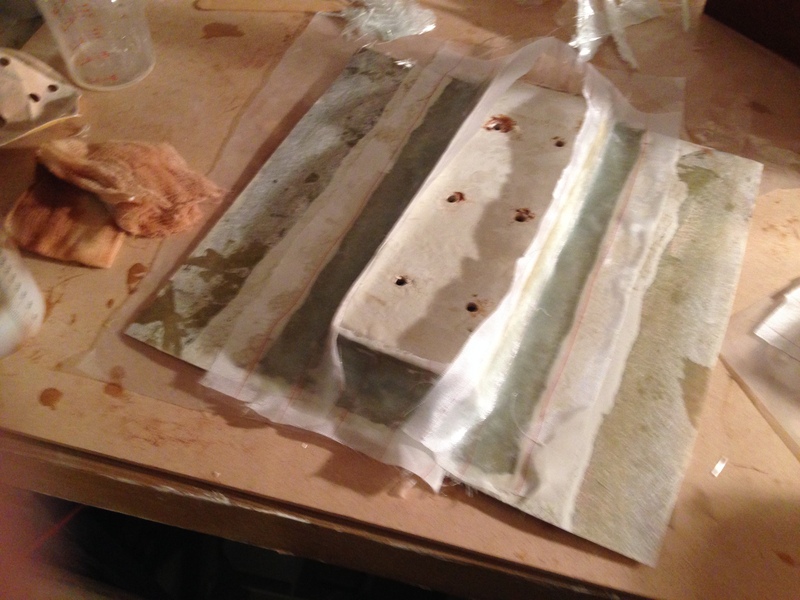 Note also that you can see the rusty shadow of where the foot of the truss sat on the first pour of resin. Success! That hardest job is done, the truss is out. 1.4 So, you have a crack in your keel? If you have managed to get away without cracking your keel, do a little dance and move on. 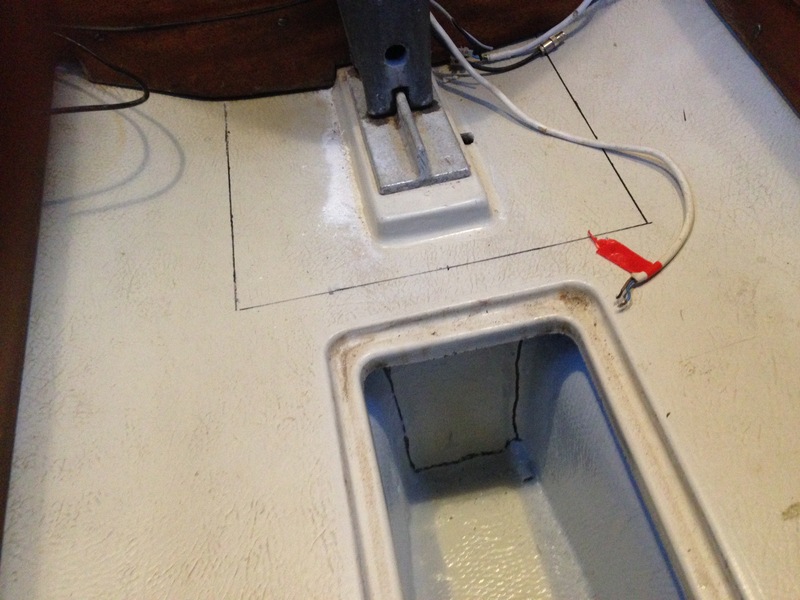 However, do check the front of the keel inside very carefully. My crack extended beyond where it was letting water in. The yellow in the below had cracked to about 70% through the glassfibre, and had been that way for some time as it was stained by rusty water so had to be ground right back to healthy GRP. 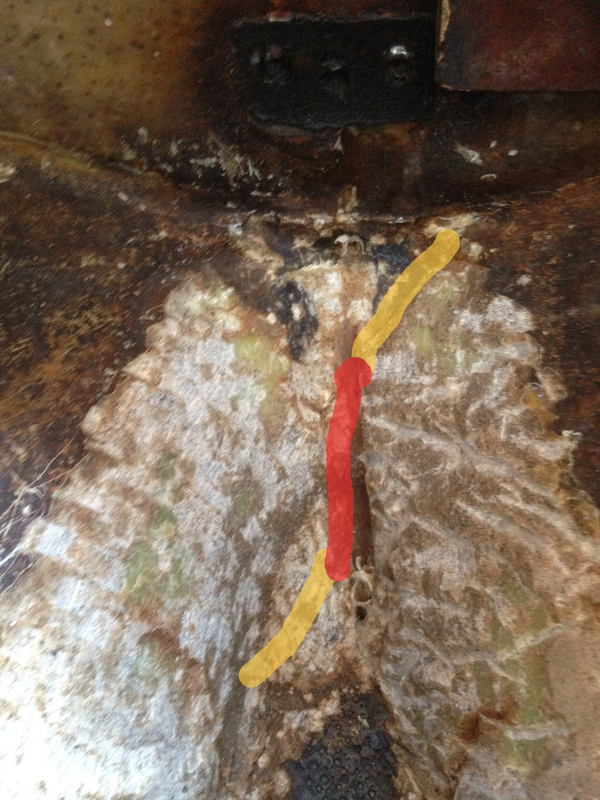 The red section shows where the crack split right the way through. Decisions, decisions. You have some options available to you here. The original design was a mild steel truss, encapsulated in resin – this was clearly as mad as a box of frogs as mild steel rusts, expands, and splits the boat in two, so I would suggest against encapsulating anything down here at all, be it wood, stainless or hens teeth. Why did Albin Marin not use stainless steel to start with, I hear you cry? 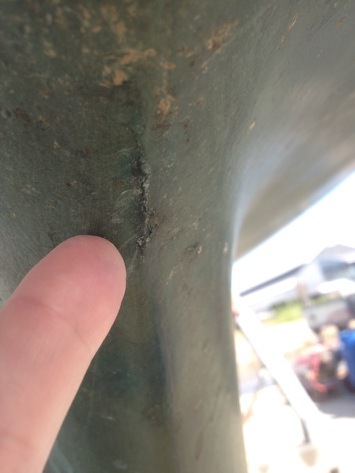 And that’s a fair question, the only reason I can fathom is that stainless steel is more noble than mild steel and that could have led to the bottom of the mast and mast foot (which is, of course, aluminium) being eroded away by galvanic corrosion. 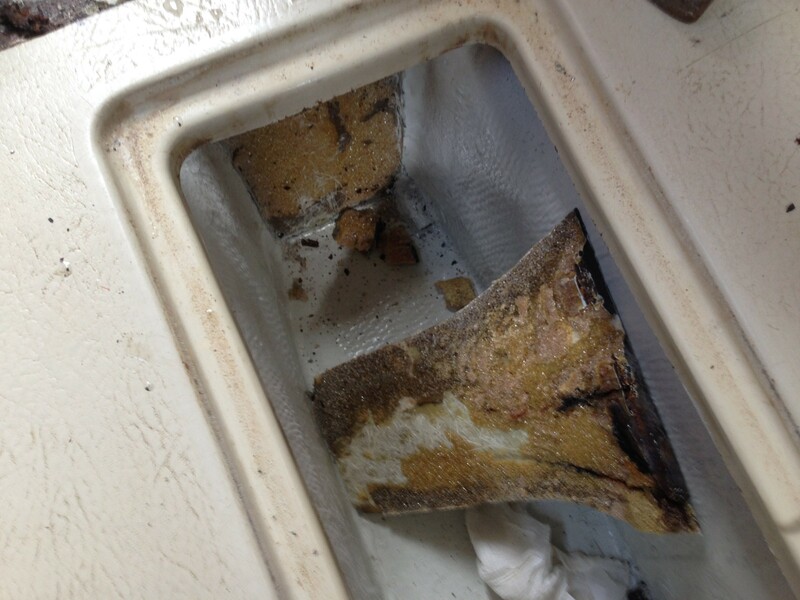 Additionally, stainless steel can be prone to crevice corrosion, so encapsulating it in resin would have been bad news. Bob McGovern is a sage, skillful and wise Ballad owner (a 1972 Ballad, probably hull number 18) across the pond in the states (Wyoming to be precise), he extracted his truss before I did my own and gave me a wealth of information about the process and lots of support. This truss fits our Ballad recess snugly — main bulkhead to first bilge divider; original truss platform to underside of GRP ‘cap’. It is slightly taller and very much longer than the original truss, and it is possible not all Ballads have truss recesses identical to ours. The foot and top plate of this design are wider than the original, to maximize bearing surface; a new GRP cap will be required after installation. If you wish to re-use the original GRP cap, you should reproduce the top plate dimensions of the original truss (c. 82mm wide). Materials thickness and choice will vary by owner preference. 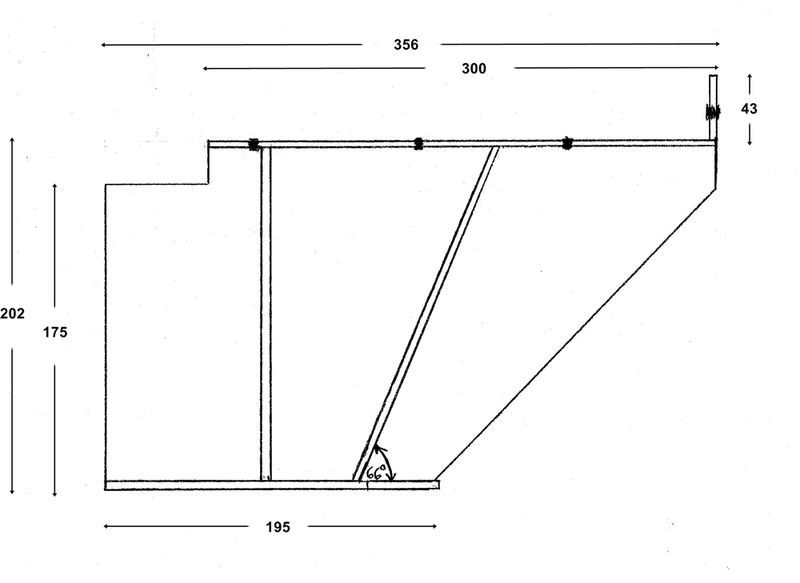 The original truss was 3-5mm mild steel (1/8-3/16″); 304 or 316 stainless of the same dimensions could be substituted with minor loss of strength. Aluminium should be roughly twice as thick, 7-10mm and 6061 where available. While I think this design will be much stronger than the original, all present are warned that I flunked out of mechanical engineering at university. 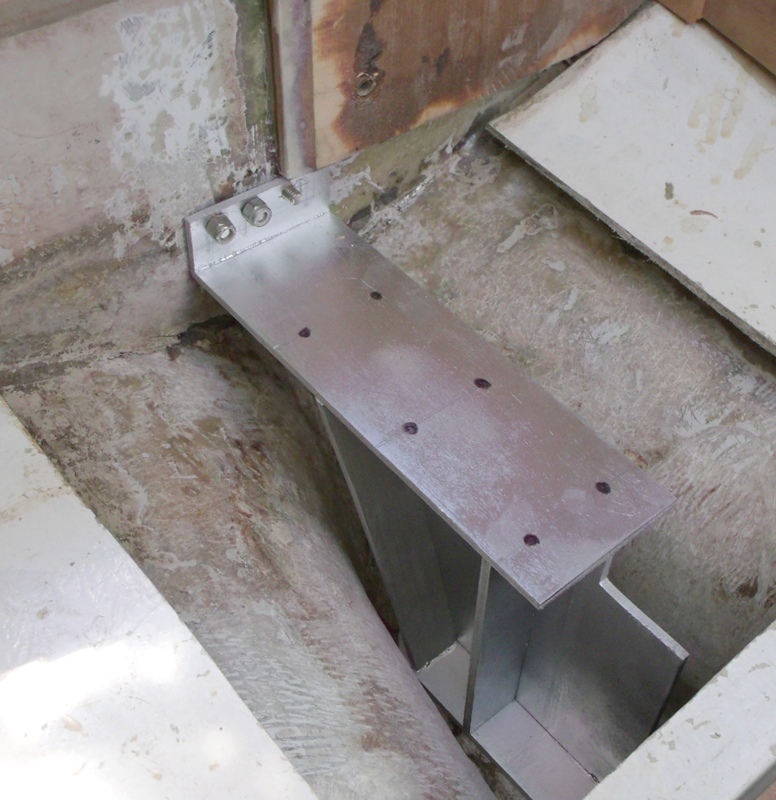 Rather than surrounding the new truss with solid resin, we intend to merely brace it to the keel laminates with epoxied spacers, and to bolt it fore and aft to the bulkheads. 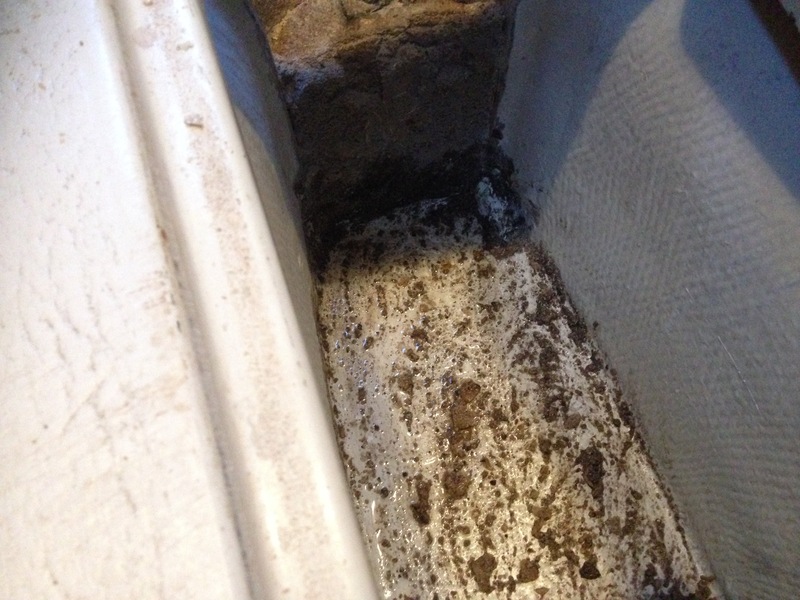 Good drainage of the foot area is still required. 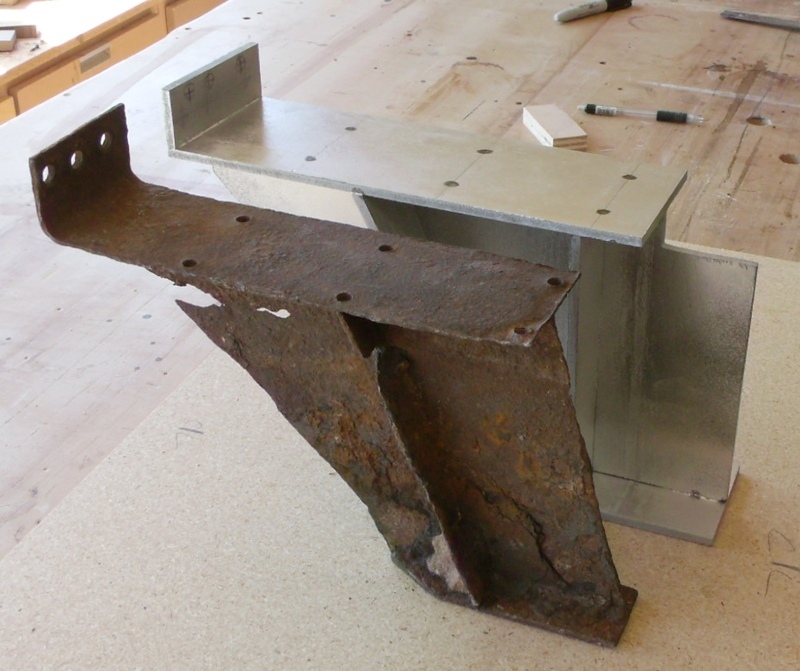 Finally, no measurements are provided for the mast base plate holes, nor for the holes attaching the truss to the main bulkhead. 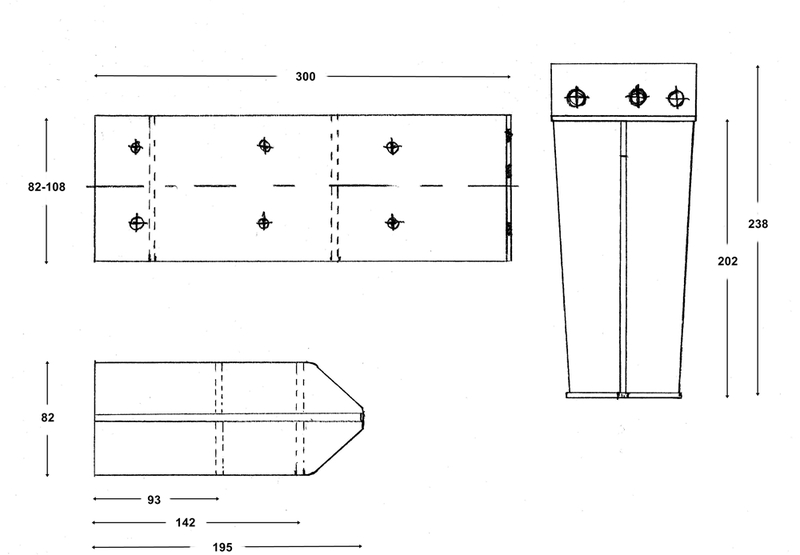 I will assume these are slightly different for each boat; greater accuracy will be accomplished by templating your original truss in place, then transferring the hole locations from the template to your new truss. 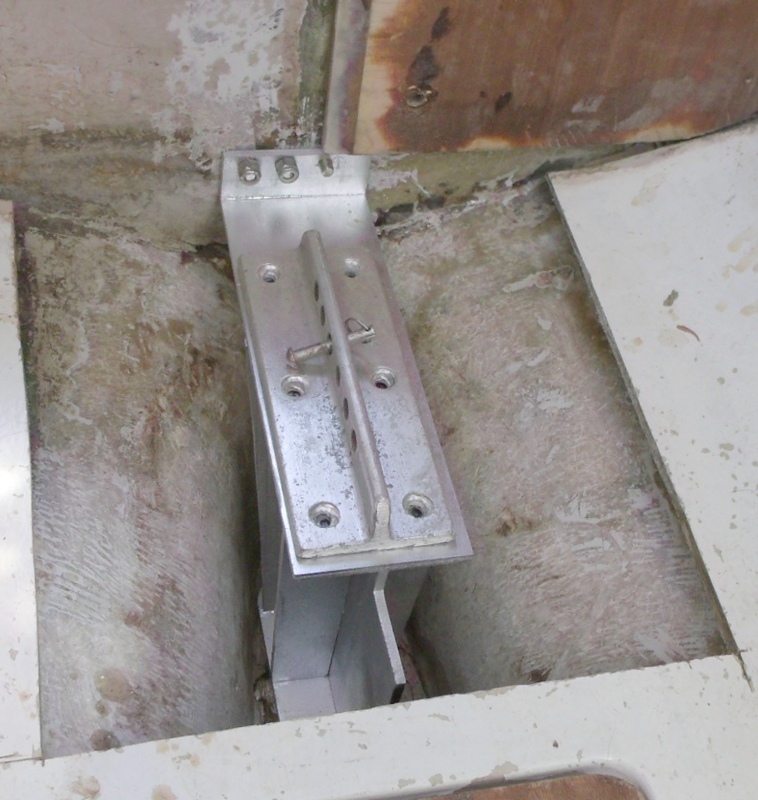 Every 1cm error at the mast foot translates into around 6cm error at the masthead, so it is important to put the base plate exactly back where it belongs. I went a long way down the road to following this approach and went so far as to make up a template to take to the fabricators. I was eventually put off the idea by my good friend and marine surveyor (the learned Alf Cackett). 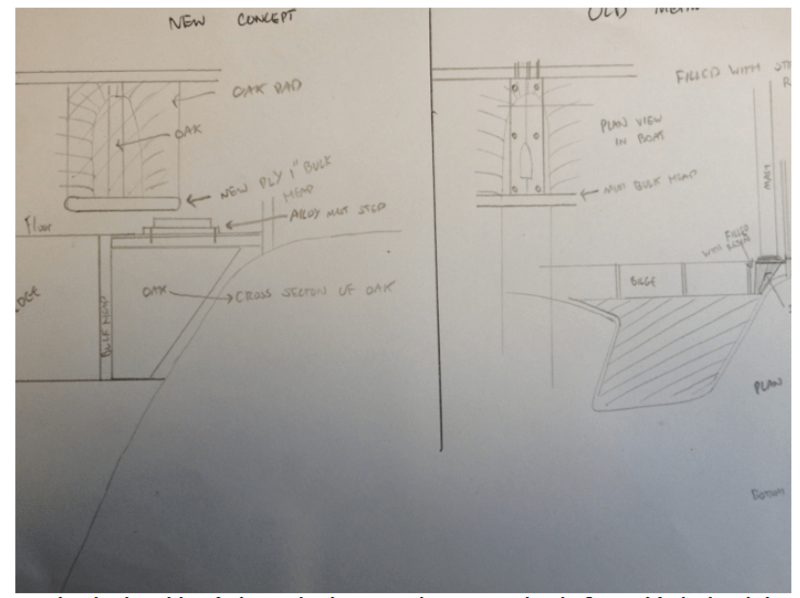 He suggested the tolerances were too tight, and that if the fabricators were a millimetre out, or if my plans were out in any way, it would be a throw away and start again job. 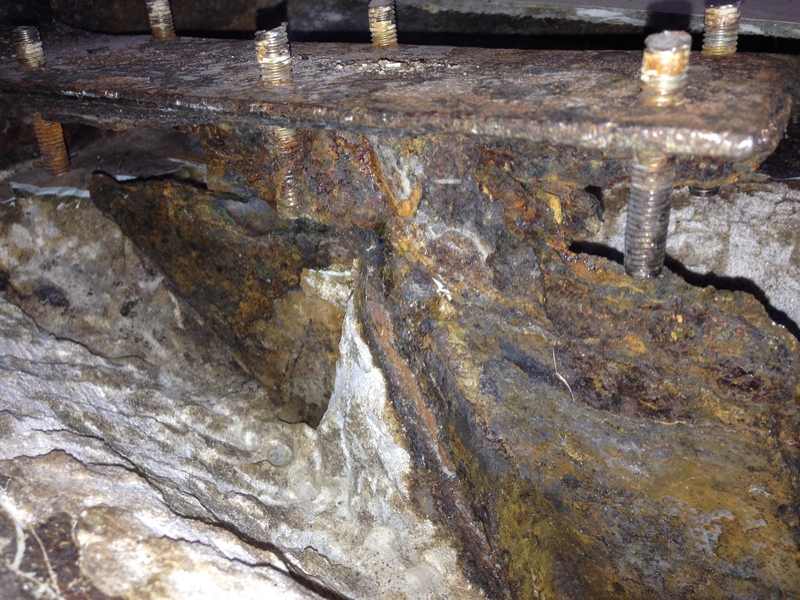 Also, using any exposed metal in the bilges he suggested was a bad idea citing the original failure and the potential for corrosion, and that a composite (wood, epoxy and glassfibre) truss would be more forgiving to manufacture. I hasten to add, a lot of Ballads have used a stainless steel replacement truss, so it is a valid and proven fix. At its most basic, the principle of composites is to take a material with a strength of 1, combine it with a material with a strength of 1 and come out with a composite material with a strength of 5. The truss in our Ballads has to support the whole compressive load of our rigs, for which the crude rule of thumb, is the displacement of the boat, so slightly north of three tonnes. Whatever we put in, must support this. I took advice from many places. East Coast fibreglass were very helpful, as was David Johnson at Wessex Resins (the West Systems reps in our area), as well as Alf Cacketts expert input first hand on the boat. 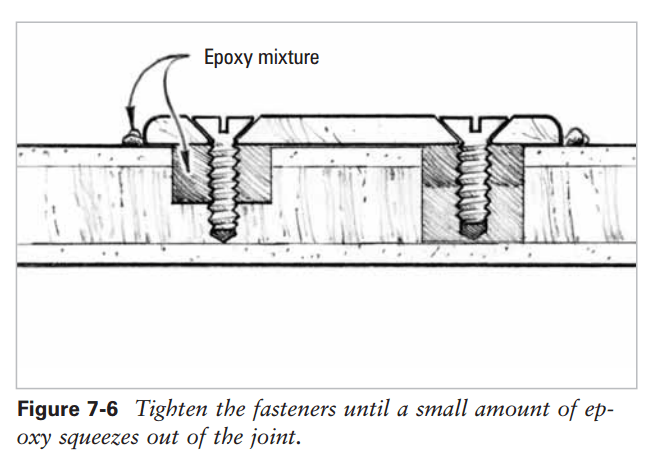 West System Epoxy – Epoxy resin has far better secondary bonding properties (so its ability to ‘glue’ on to other substrates) than Polyester resin, it is five times more expensive than polyester resin, but its also five times stronger – money well spent in this structural area. West System 404 High Density filler – Wessex suggested this to fill voids and create fillets where required due to the high loads. 25mm Robbins Super Elite plus Sapele plywood – My father was a shipwright and he swore by Robbins. Its not cheap! For my quarter of a sheet it came in a well over £100, but it is the best marine plywood you will find. Peel ply! – This is the best gift you can give to yourself. Robbins, surprisingly, could not quote a compressive strength for their plywood products. After talking to their production plant, they did comment that the glue layer of their product was stronger than the wood layer, so that meant the weakest part of the plywood would be the Sapele. Sapele has a compressive strength of around 60 MPa (MegaPascals, which is about 20% stronger than White Oak) which converts to around 4 tonnes per square inch of compressive strength. So, on a single inch square of Robbins plywood, before any composite reinforcement, we could support our whole rig, so the materials are up to the job. The truss is around eight inches long, so on the Sapele alone we could support some 40 tonnes. 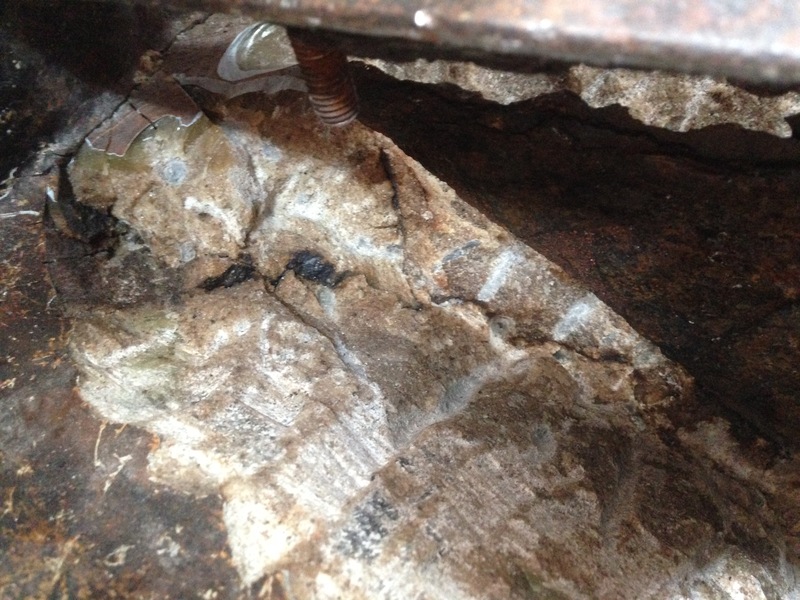 Wood does rot though, so it is imperative that we fully encapsulate the new composite truss in epoxy and fibreglass. 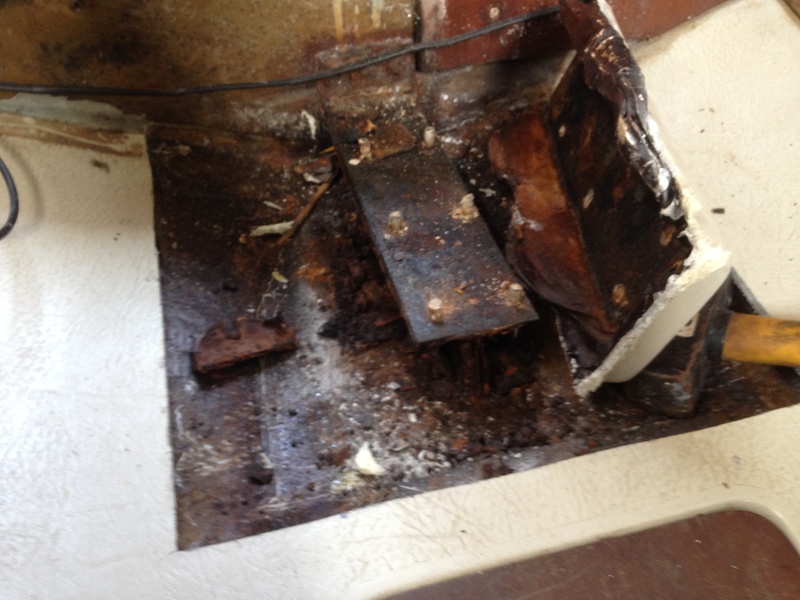 If the job was botched, and even a small gap was left where water could penetrate to the wood, it would be disaster and the water would become trapped in the rest of the epoxy/fibreglass structure and the wood would rot and fail rapidly. The structure I opted for was based broadly on the design Alan Harris-Guerrero of SailShape used in his Ballad, which was documented in the UK Ballad Association Summer 2013 newsletter. 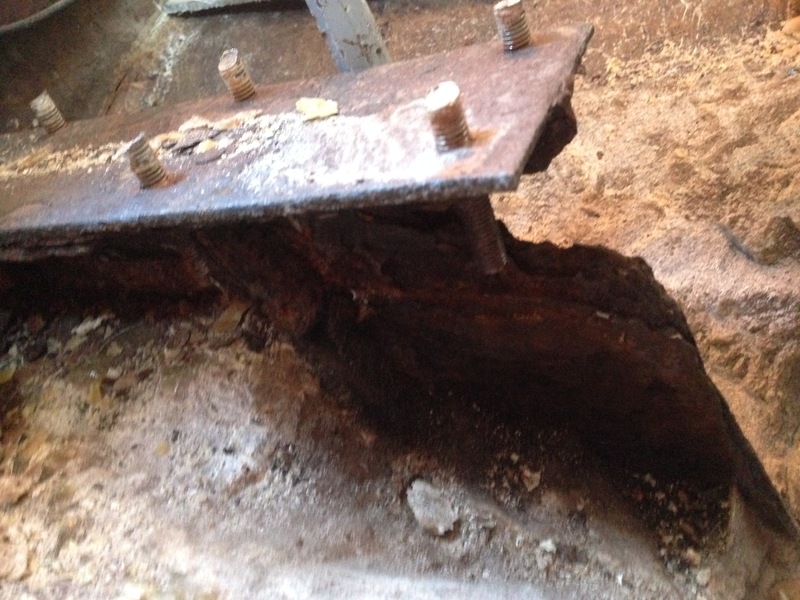 This was constructed wholly out of 25mm plywood, consisting of a small new transverse mini bulkhead forward to support the truss cap and a large bulkhead to replace the one that was removed when chipping the truss out aft. I first cut templates out of cardboard, then glued together some MDF to 25mm thickness to create some mock ups to dry fit before I started hacking away at my expensive Robbins plywood. Once I was confident I had the shape correct, I got to work cutting out and dry fitting the plywood. 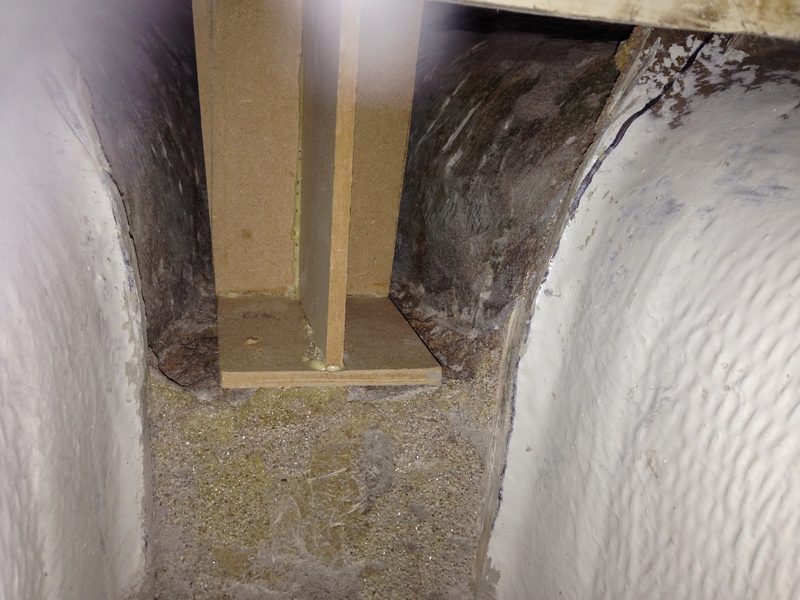 Angle obtained using a 1cm shim at the stern of the top of the truss and filling with west and 404 filler. One thing that became apparent was that in order to obtain the correct angle for the truss cap, I would need to create a small shim and build the level at the aft of the truss by around 10mm. Wherever possible when using epoxy, I used peel ply so that I would not need to wash (the amine blush off), sand and prepare it and it would be ready for the next stage of the process. 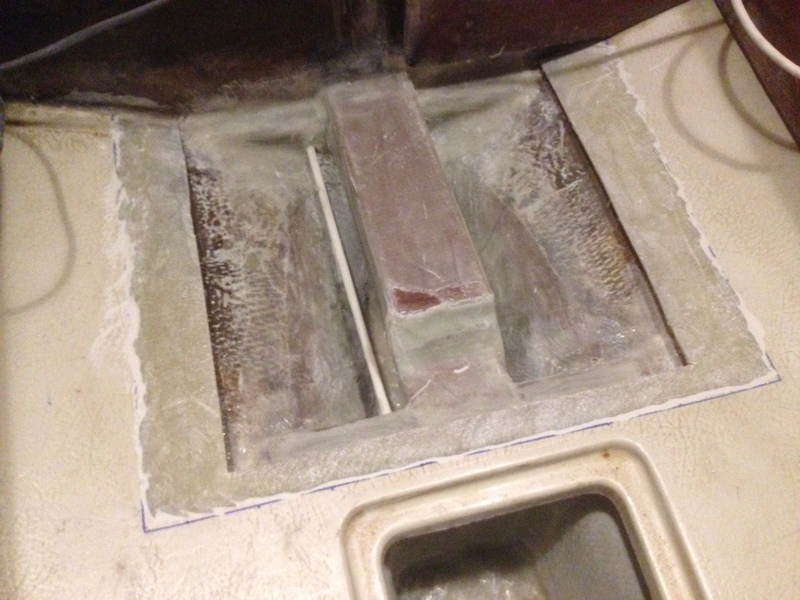 I introduced drainage by using an extruded fibreglass tube to take water from the forward locker to beyond our new aft bulkhead, and two channels from the truss cavity itself just in case water penetrated the area. 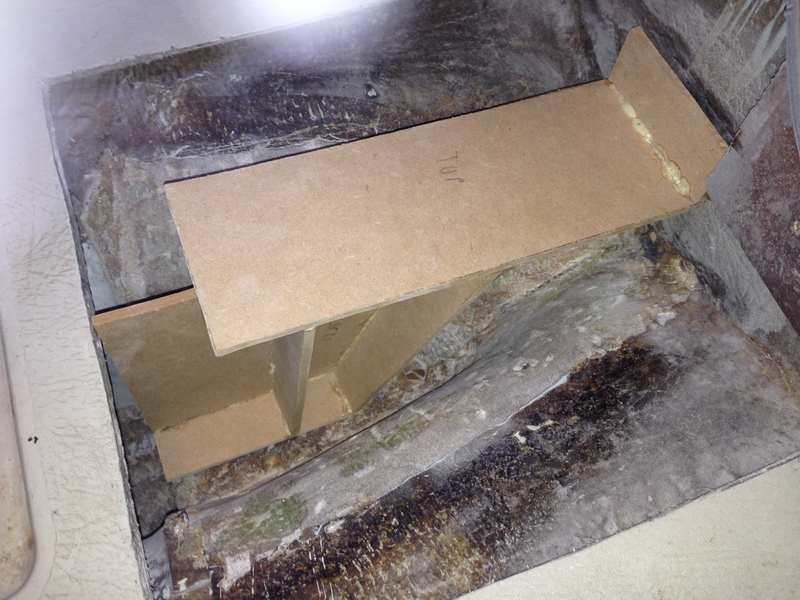 Finally, not happy with three layers of epoxy and one of fibreglass, I introduced two more layers of glass fibre to further reinforce the whole structure. Unfortunately, the two extra layers didn’t quite make the ‘bend’ at the stern of the truss, so I had to carefully grind those back to a single layer of glass (note the darker patch at the back of the truss below). 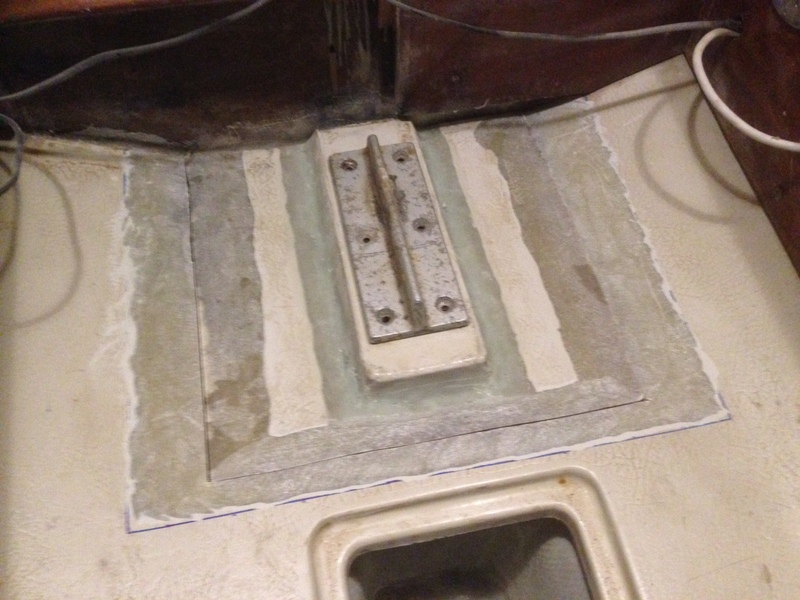 That area will be solid with epoxy and 404 filler when the sole is refitted and the build is complete so it is of no consequence. I had my surveyor take another look at this point, and he gave it the thumbs up. Truss complete! 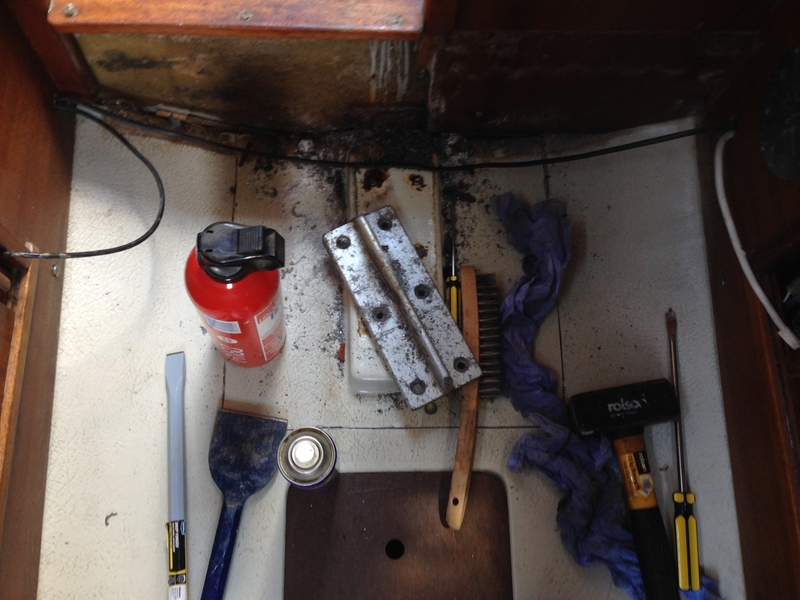 We had to hack the sole into two pieces when we removed the mast foot, so the first job is to glue these two pieces back together. The West System fibreglass repair manual is a cracking resource, and tells us we really need to attain a 12:1 bevel. 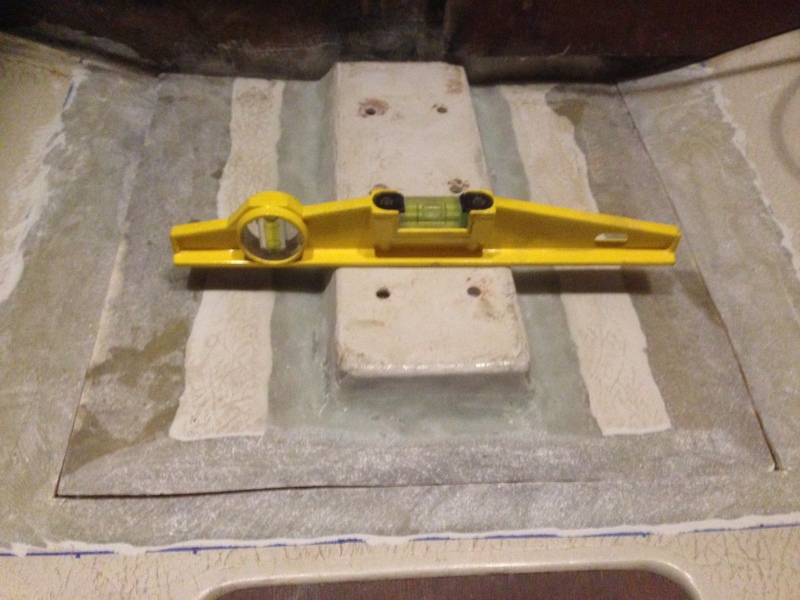 The GRP is about 50mm thick on the sole, so ideally we need to bevel out to 6cm either side, we can’t quite manage that, but its not far off and feels pretty strong after bridging with ten layers of fibreglass and epoxy. 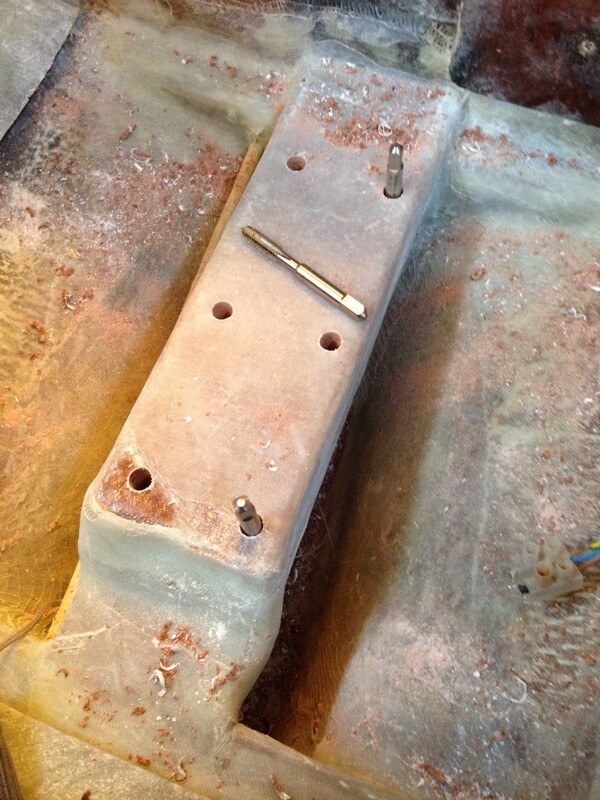 Finally, we can offer the sole back into the boat and bevel out the surrounding sole to get the strength back. 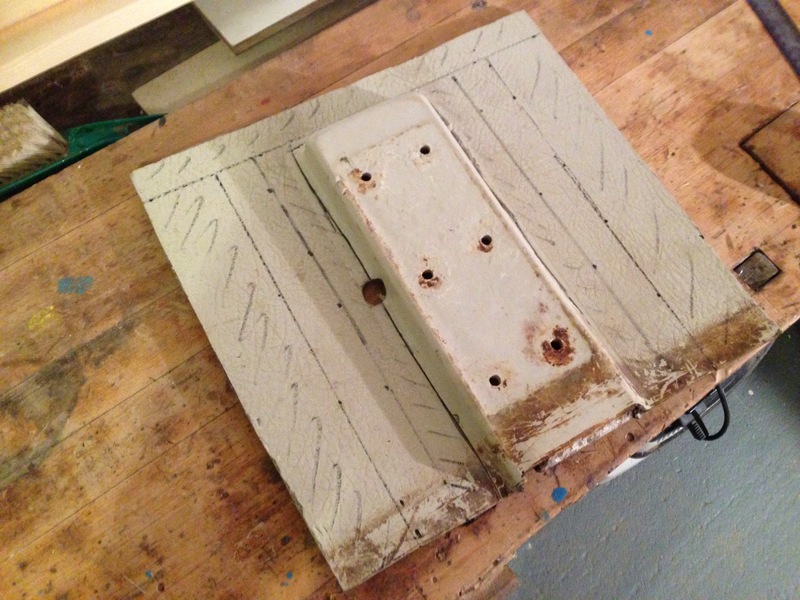 The mast foot is secured down with six M8 60mm machine screws. 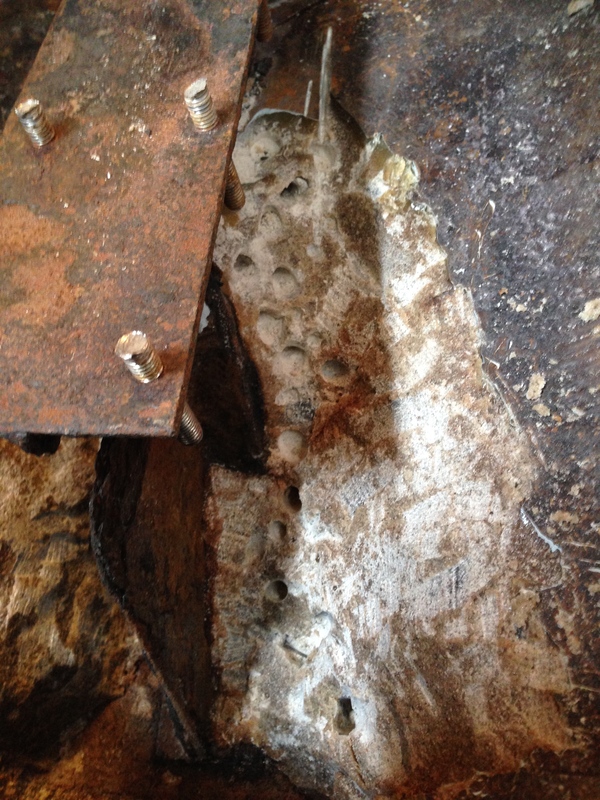 We need to ensure that water will not penetrate the truss through these holes that we drill, so we oversize the first 50% of the depth of these screws to 10mm and only tap the final 50% to M8 and use West System and 404 filler as laid out in the West documentation to make sure no water will penetrate.